Yes, all transactions are submitted with 128-bit encryption. Yes for United States citizens. 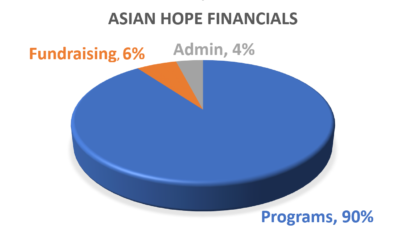 Asian Hope is a registered 501(c)3 in the U.S. However, we always advise you to ask a tax professional or Certified Public Accountant questions on deductibility status and any other more specific questions. An email receipt is sent for credit card donations and a mailed receipt is sent for check or cash donations. Asian Hope will also send out year-end statements before January 31st. Can I give via mail or phone? Our office phone number is 434-942-0287 if you have any questions. How do I support a team member? If you would like to support a team member, please visit our donate page and choose Deputized giving. You will be able to write in the name of the team member you are wanting to give to.